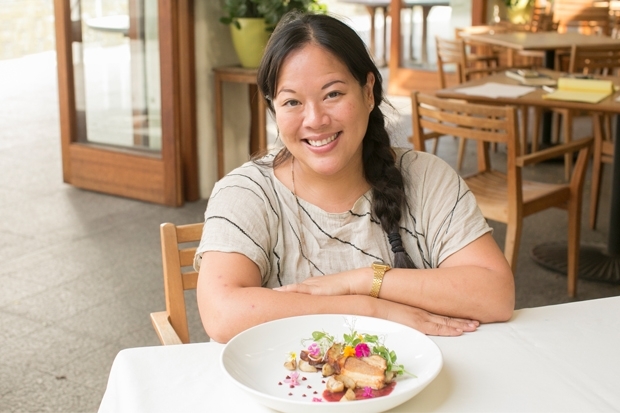 Before going to culinary school, chef Lee Anne Wong of Koko Head Café in Honolulu and Sweetcatch Poke in New York City (and extreme multitasker and new mom! ), studied fashion design at the Fashion Institute of Technology in New York. She also is an art collector. So she was a natural choice for the Honolulu Museum of Art’s April 6 spring benefit Palette—an event featuring food inspired by works from the collection. Along with Wong, the event features chefs Kevin Lee of Pai Honolulu, Wade Ueoka and Michelle Karr-Ueoka of MW Restaurant, and HoMA’s Robert Paik. They were invited to wander the museum or browse a selection of images of artworks and select one on which to base a trio of dishes—two small bites and one full plated course. 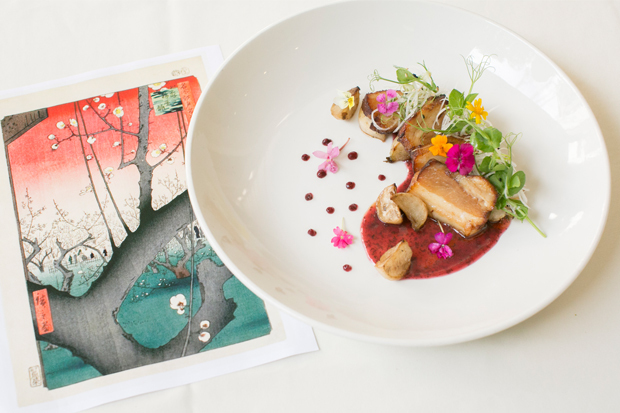 Art and food—Lee Anne Wong’s glazed pork belly dish for Palette. The result is a work of art in its own right—with dots of ume echoing the syncopation of the plum blossoms in the print. And Wong’s creation has an extra sense Hiroshige’s work doesn’t—taste. Come to Palette to experience the flavors. See the full menu online. Next week: We reveal Kevin Lee’s art pick and the dish it inspired. Love it! Great version of her inspiration!